Hello my friends! Cherry here at the RRR blog today! I always find it so confusing when Easter falls in March. Do you? Growing up it was always in April. So happy it falls this year like it does. It gives us more time to enjoy this special time of the year. I love to welcome in the soft pastels of the Holiday and embrace the shabby that pairs so well with Spring time. With that in mind I created this vintage Easter decoration using old tart tins and sewing spools. I first painted my tart tin with Ballerina Pink spray paint and than gave it a good aging with my rusty technique. I use bleach and white vinegar. Generally I leave my item in the solution over night. I love the patina it gives things. Peach Cherry Blossoms that I tea stained. I love the subtle aging tea staining adds to my florals. 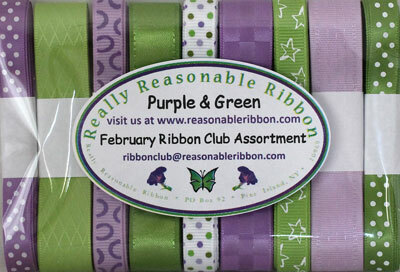 Welcome by Really Reasonable Ribbon today. 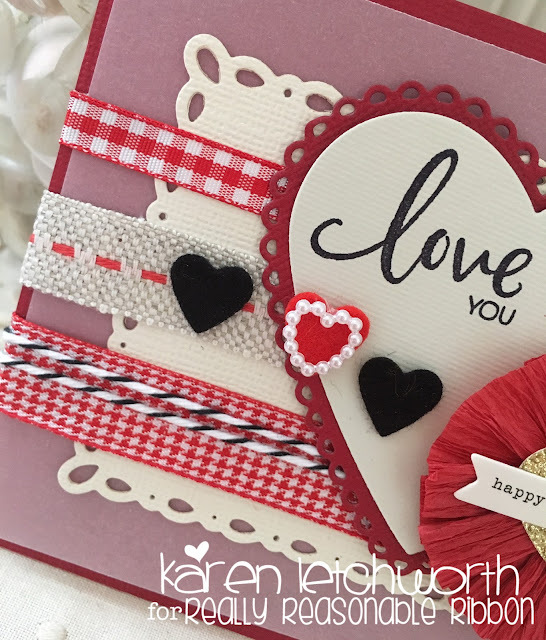 It's Karen today sharing a sweet and simple card. 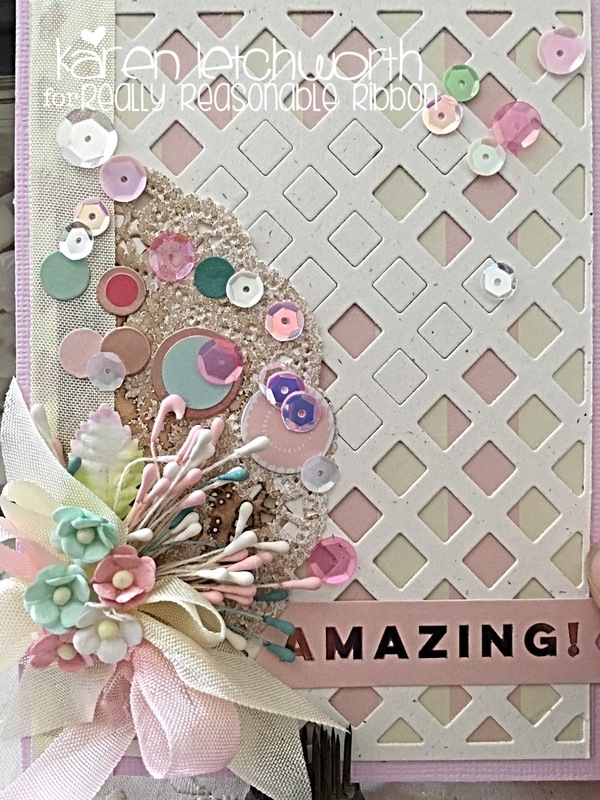 It started with a cardstock base, and then I added one piece of pink/white striped patterned paper. I covered that with a die-cut background template, then added half a doily and a sentiment sticker. 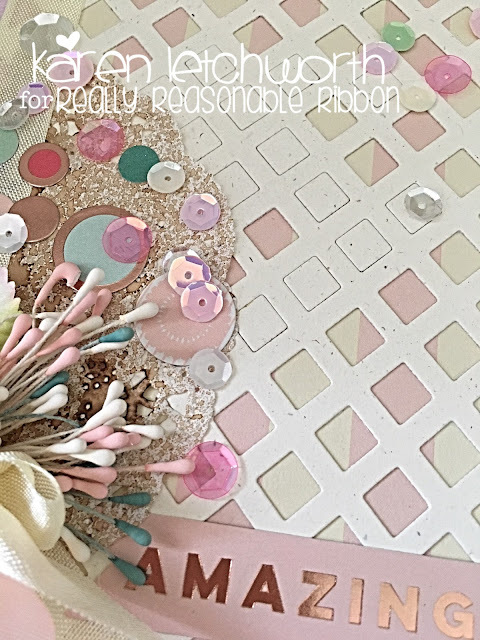 Then came the really fun part.....adding all the wonderful touches from Really Reasonable Ribbon. First, I ran a length of Cream Seam Binding down the left-hand side of my card. I used that same Cream Seam Binding along with some lovely Baby Pink Seam Binding to create my bow. I tucked in some Miniature White Double-Head Stamens, Miniature Pink Double-Head Stamens and Miniature Green Double-Head Stamens. 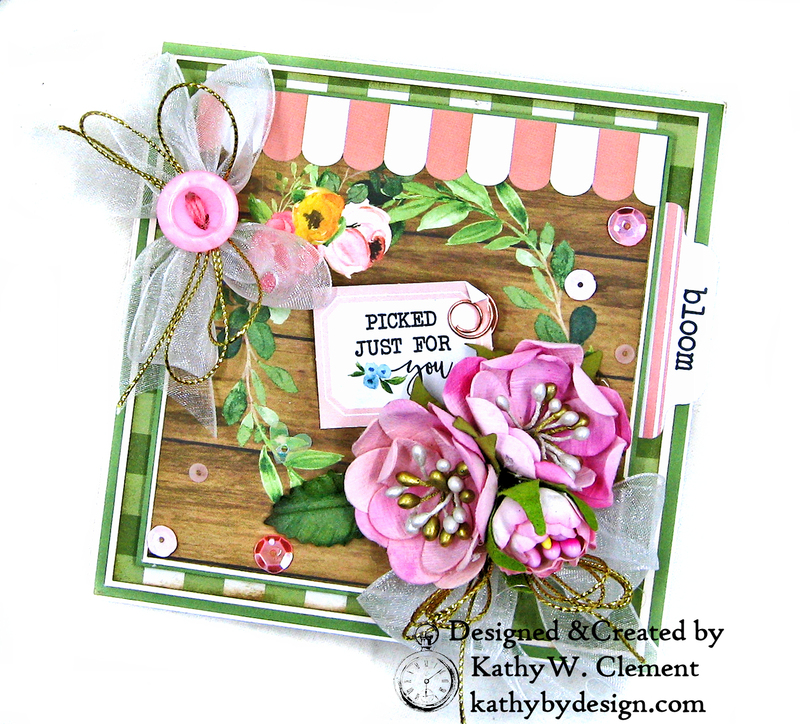 On top of the Seam Binding bow, I added a 30mm Tow-Toned Pink/White Mulberry Leaf and some pink, green and white flowers from the Mixed Pastels Miniature Sweetheart Blossoms. By the way...they're GORGEOUS! The final touches include some circle-shaped stickers and some sequins. I just LOVE how the ribbons, stamens and flowers give the card such a soft, sweet, and romantic feel. Ribbons and trims also add texture and life to our cards and projects, and there are SO many choices at RRR. There's lots of great inspiration every day on the Really Reasonable Ribbon Blog, and lots of great products in the RRR Shop. We hope you'll stop by often, and let us know if you have any questions about anything. We're here to help. Hello, Ribbon Lovers! So tell me, how do you feel about white ribbon? Today's Buttons and Bows Shaker Folio is a study in blue, which is my favorite color. And nothing goes better with blue than crisp, white taffeta ribbon. I used my faithful Zutter Bow-it-All Tool to tie a 3" double loop bow on the left hand side of the shaker box. Silver Metallic String adds another layer of sparkle and shine and a vintage blue button finishes the bow cluster nicely. White Taffeta Ribbon does double duty in this 5 1/2" trifold shaker folio. I used it as the closure mechanism and tied a bow on the side. To do this, wrap the matted layers of your project with 1/2" Scor-Tape. Then press the taffeta ribbon onto the sticky strip and you're good to go! What do you do with your ribbon scraps? I like to thread them through the tops of little tags, or tie them in a square knot to decorate a honey stick, as I've done here. The more I use Taffeta Ribbon, the more I love it. It ties crisp, poufy bows and comes in loads of wonderful colors! Hi friends! 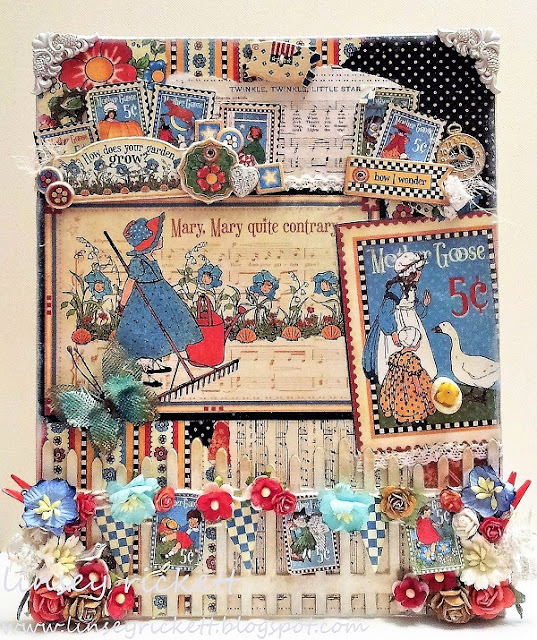 Linsey here sharing my Mother Goose Mixed Media Canvas Board! This is one of my most favorite projects I've ever made to date and I hope you'll enjoy it too! 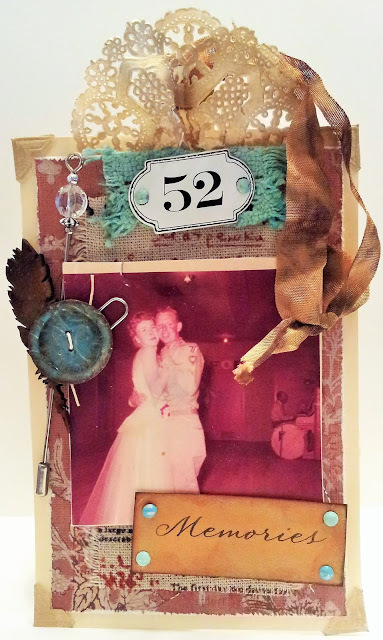 Maybe even be inspired to create a mixed media project with ribbon and trim of your very own! I used some White Crochet Lace Trims adhered with Mod Podge glue which works really well. For the banner, I used Wheat Stripe Diva Collection Baker's Twine and added lots of mulberry flowers including Red Open Roses, Mixed Earth Tone and White Open Roses, Sweetheart Blossoms White with Red Center, White Cosmos Daisy Stem Flowers, Mixed Blue/Aqua Cherry Blossoms and WOC White Spiral Stamens. I hope you like it! I really enjoyed designing it! I find mixed media art to be very fun and carefree. Very little stress and lots of room for happy little accidents! 😊 Thanks so much for stopping by and until next time, happy crafting! Today I wanted to share a couple of the bags and boxes I made for Valentine's Day last week. The two I'm sharing were made for my friend Jennette, and the gable box was made for my husband. I had also made another bag for my doctor and then another gable box for my Mom. I used lots of fun Really Reasonable Ribbon flowers, lace, leaves, stamens, and goodies on these boxes and bags. I really just enjoyed making them to give away, it felt so good! The bags, they were up in my cabinets. You know, I had these for a long time, they were kinda flimsy, but after adding the good design paper around them they ended up being super sturdy and very very nice bags, strong enough to hold a heavy large chocolate candy kiss and several other items. Adding Paper- after gluing and using Scotch tape runner and 5/8" Scor-Tape (helps to keep paper on WELL) to put my paper on, I added the beautiful Really Reasonable Ribbon Gabrielle Off White Lace. I also used the beautiful Pearl Pink Delicate Satin Ribbon to create a beautiful big bow, then added the darling Strawberry Brownie Stitch grosgrain ribbon on top of that. I then made my glass flowers using Cheery Lynn's flower dies (my makersmovement) and placed an 8mm white flatbacked pearl in the center of it. So I cut out a heart filigree piece using shimmer card stock, then added my white swirls (Cheery Lynn) and placed my Really Reasonable Ribbon White Leaves, Chelsea Rose, Rose buds, Stamens, carnation, Sweetheart Blossoms and such by using hot glue. The CottageCutz Hedgehogs were colored using Copics and then placed using RRR foam tabs. I really had so much fun decorating up the bag here. 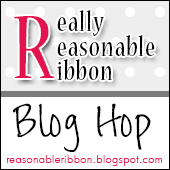 I will link all supplies used below from the Really Reasonable Ribbon store. For the Gable Box for my husband I used more of the Really Reasonable Ribbon supplies listed above but added all reds and browns to this one, and a tad of pink. I made him a cute little coupon book for a dinner out, movie out, free lawn mowing, and back rub :) also there are lots of chocolates in the box and a gift card. The rose was from the roses he had sent to me, I figured it would be nice in the photo. I hope you enjoyed my post for today! Thank you for stopping by, and have a lovely rest of the week! Totally GORGEOUS projects on the hop, I couldn't pick a favorite if I had to!! The lowest temp here this winter (last week) has been -23 below, with a wind chill of 48 below, I think if we had one more day of that I would of lost my mind, it was horrendous!! Now this week we have had freezing rain, then rain on hat and now more snow today...I am counting the days til Spring! Hello there friends and crafty peeps! Ginny here dropping in with a very vintagy Easter greeting card. I've really been enjoying creating greeting cards in the 4 x 9 inch size. It make for a fun new challenge on how to fit on all the elements that I love to work with. I'm using pretty coordinating trim as well as a fair few WOC flowers. I've layered these with some die cut foliage and loopy bows of burlap string. More flowers here for the top and a sweet sentiment clipped on. Coordinating sequins are the perfect finishing touch. ~Really Reasonable Ribbon~Diamond Satin Blue Topaz, Ivory Burlap String, Chrysanthemums, Cherry Blossoms, Light Turquoise Open Roses. I just adore this whimsical paper I picked up. I diecut the sweet animal faces into circles and layered them with several paper layers. I added some fun pom poms in pastel colors. I also embossed my sweet mini tags using Archival ink. What was the lowest recorded temperature in your neck of the woods so far this winter? Some of the temperature readings I've seen on the news are incredible. I hope you are keeping warm and crafting on!! In southern NY we have been in the double-digit negatives too many times already!! Our winner will be selected from the numbered comments on this post on Tuesday, February 19th. Be sure to check back on Tuesday evening to see if you are our lucky winner. Hi friends, Linsey here today sharing a cool technique that will change your ribbon and trim in a most unique way! Have you ever tried bleaching your ribbon? 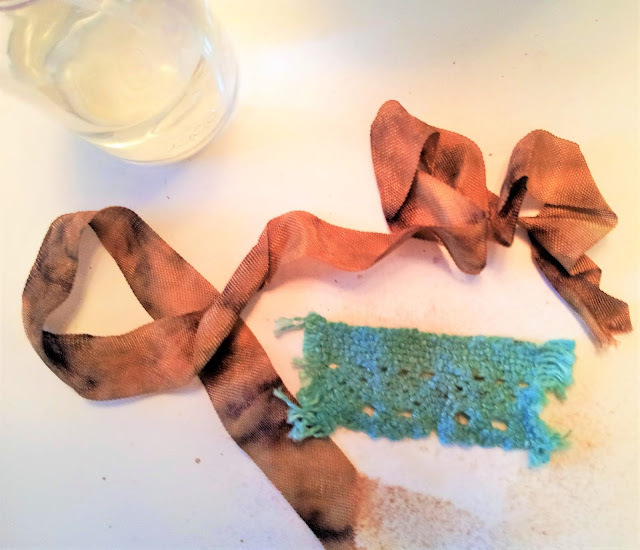 It's really easy and fun to see how the bleach will react with your ribbon, creating a one-of-a-kind look! Here's a vintage-style tag I made with bleached ribbon and lace trim that turned out great! My heritage tag features patterned paper, layered with a piece of Cotton Blend Printed Ribbon, then a photo of my Grandma and Grandpa on their wedding day. A piece of Tobacco Seam Binding was sprayed with bleach to create darker and lighter tones. Some of the bleach puddled a bit to make blotches and a very weathered look. It's just right for vintage, antique and heritage projects alike! A small piece of Ivory Crochet Lace was bleached out, then turquoise ink was sprayed on it. 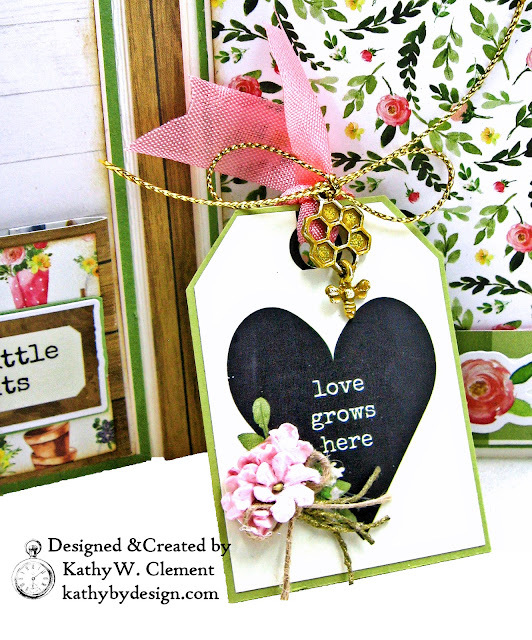 This also created a vintage look and feel that is perfect for my tag. I hope you'll give it a try sometime! 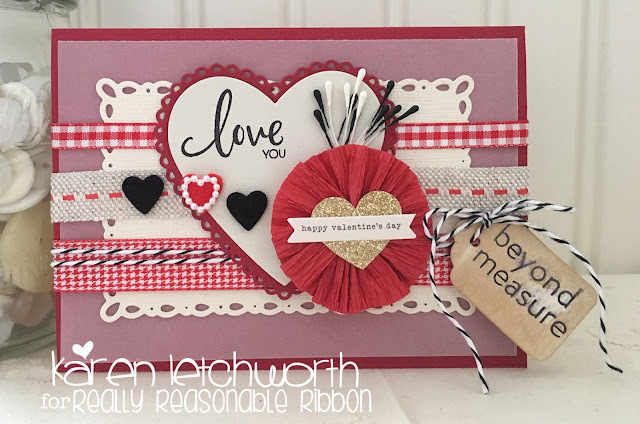 Thanks so much for stopping by and letting me share my tag and ribbon inspiration with you! Until next time, happy crafting! Hello everyone and happy Monday to you all! 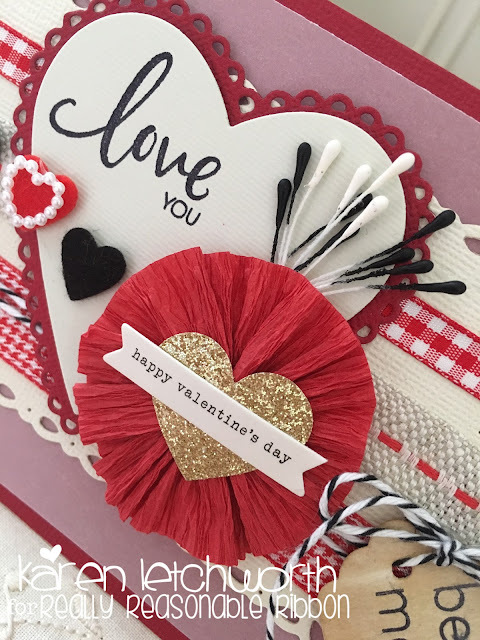 Today I have a Darling Valentine Gable Box I decorated using beautiful taffeta, grosgrain, roses, and other beautiful supplies from Really Reasonable Ribbon which I have listed below for you. I absolutely LOVED making this darling gift box, it was so much fun to decorate, and will be doing another one too! 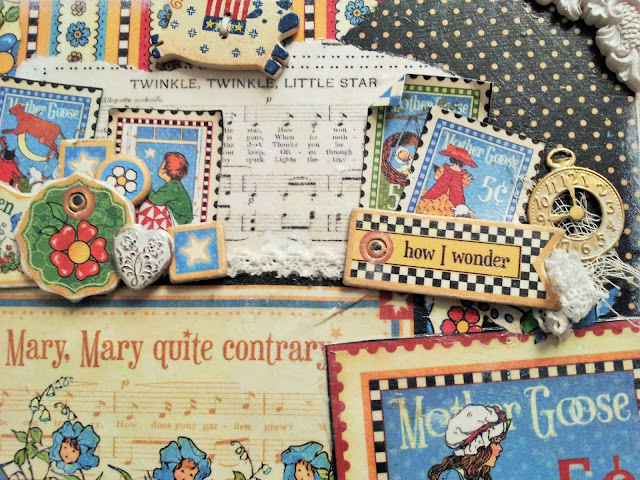 On my box I started with a Christmas Gable box my mom had given me. They came in a package of 4, so I covered up the sides that had snowflakes on them, and the front was an oval, and decided to cover it and cut a heart shape out of the design paper and place a filigree heart over it. Next I used all Really Reasonable Ribbon's beautiful mulberry roses, carnations, sweetheart blossoms, stamens, and leaves to decorate the front, and LOVE how it turned out. The beautiful strawberry brownie ribbon is absolutely DARLING and is one of my favorite Valentine ribbons, it's so sweet in person, pictures really don't do it justice at all. I made a bow with it to place on top of the taffeta pink bow, and love how sweet they look together. 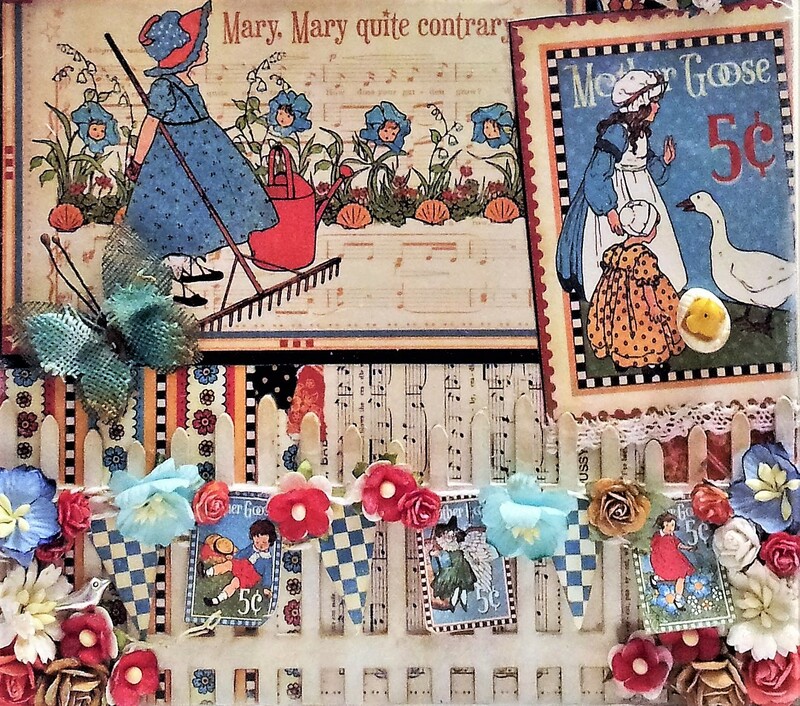 It's so nice to be back in my craft room crafting and making some fun springtime projects, and getting ready to make some albums next, can't wait to work on those! Here is a close up of the front of my box. I hope you enjoyed my post for today, as I enjoyed making this super sweet box to share with you all! Hello there friends and crafty peeps! 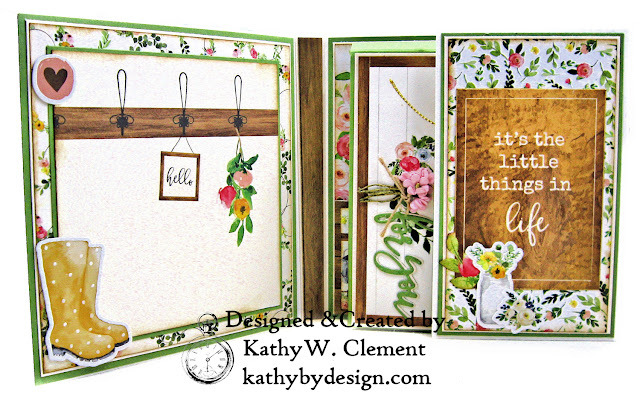 Ginny here dropping in to share a greeting card I created with gorgeous trims from Really Reasonable Ribbon. I'm pairing the Champagne Chevron Striped Twill with the Poised collection from Authentique Papers. This twill makes a lovely bow! I added a sweet little vintagy inspired sewing machine charm but it seems to be hiding under the bow. I need to add loads of flowers to all my projects to help me think about warmer weather as it's a deep freeze here in Michigan. Details like layered die cuts, and vintage buttons finish this card off beautifully!